Poster for sale on Nakatomi Inc.! | tessa.yvonne.morrison. Poster for sale on Nakatomi Inc.! Posted on January 9, 2012 by tessa.morrison. The Cirque du Soleil “Dralion” poster is for sale on Nakatomiinc.com’s website! This is a collaboration print I did with gig poster artist Clint Wilson. There is also a beautiful rare variant of this in red/gold that should be up there soon. 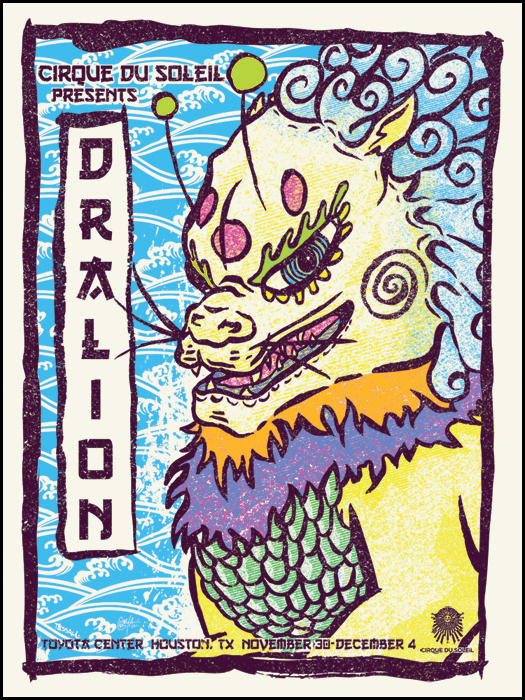 This entry was posted in Prints and tagged Austin artist, Cirque du Soleil, Clint Wilson, Clintprints.com, dragon, Dralion, lion, Nakatomi Inc., silkscreen, silkscreen artist, silkscreen poster, Tessa Morrison, Toyota Center by tessa.morrison.. Bookmark the permalink.